A cushion shape yellow sapphire set in Gold, this is a unique ring that gives the wearer power, authority, flow of income, wealth, assets, recognition, appreciation, rising, name, fame & establishment. 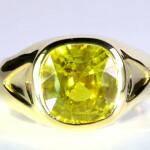 A cushion shape yellow sapphire set in Gold, this is a unique ring that gives the wearer power, authority, flow of income, wealth, assets, recognition, appreciation, rising, name, fame & establishment. Yellow sapphire or pukhraj is the gem representative of the planet Jupiter which is also the largest and heaviest planet among all the planets in our solar system. Jupiter has been portrayed as the educator (guru) of all the heavenly bodies prevailing in universe. Yellow sapphire gemstones being the gems of the teacher of the universe are placed very high in the hierarchy of all gems. These gemstones attract the positive reflections and vibrations of Jupiter including wisdom, wealth, fortune and spirituality. Yellow sapphire is quite appropriate for Sagittarians and Pisceans but also stands good for others although an expert reading is recommended by an experienced and informed astrologer whose guidance should be sought before wearing this ring.